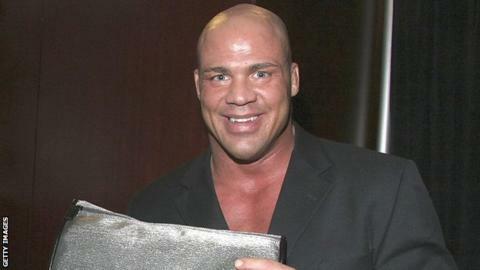 Former WWE star and Olympic champion Kurt Angle has admitted defeat in his bid to qualify for the 2012 Games. Angle, the 1996 freestyle heavyweight gold medallist, had hoped to make the US team for London but he will miss the trials on 21-22 April through injury. "Due to hamstring and knee injuries, I'm forced to pull out," said the 43-year-old pro-wrestling star on Twitter. "We were hoping father time would hold off until after London. Unfortunately it hit me prior to the trials." Angle, whose last match as an amateur wrestler prior to his attempted comeback had been the gold medal bout in Atlanta 16 years ago, added that he expected to need up to six months rehabilitation for a tear to the medial collateral ligament in his knee. Two months ago, Angle, one of the marquee names in WWE and latterly TNA professional wrestling, that, despite being unlikely to make the team, he would make every effort to compete. "What are my chances of making the team? Slim to none," he said. "I'm not going to lie but, if I can look you in the eye and say I have a chance that's more than enough. That's worth training five hours a day to get ready for the trials and for the biggest event of all, the Olympics." Angle also admitted that 10 years of hard living had taken its toll and that he would have to work on his fitness to make the United States' team at an unprecedented age. "I've had a rugged 10 years. I've been through painkiller abuse to broken necks to wrestling 300 days a year, beating my body down," he said. "I've had to change. I've pulled back on taking chances. "You've got to stay in pretty good shape to be a pro wrestler and all the TNA wrestlers get a bit nervous when I wrestle them because they're afraid I'll tire them out but the Olympics is a whole different level. "I'm not even at peak condition. It's kind of like a work of art, you're drawing this painting and you want to see what it will look like at the end." Angle locked in for Olympics?